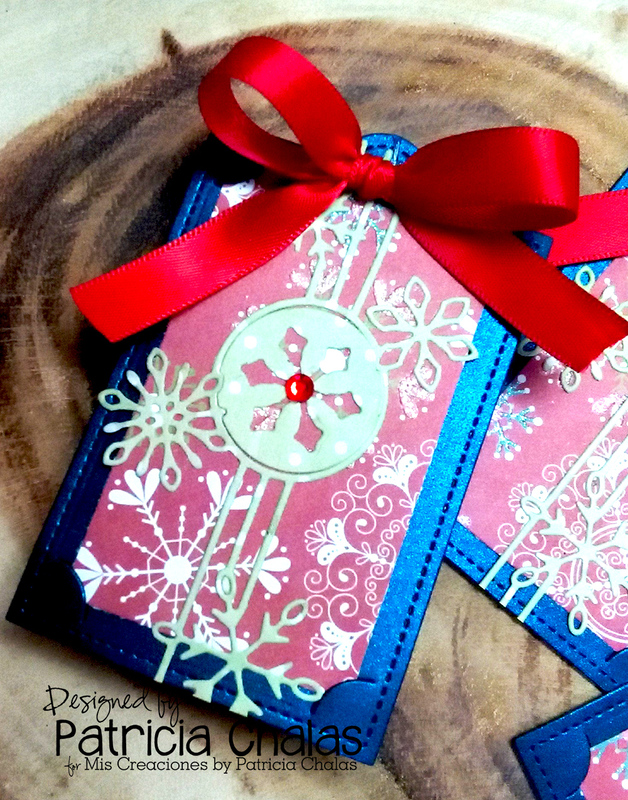 Dies R Us: Cute & Simple Christmas Tags! 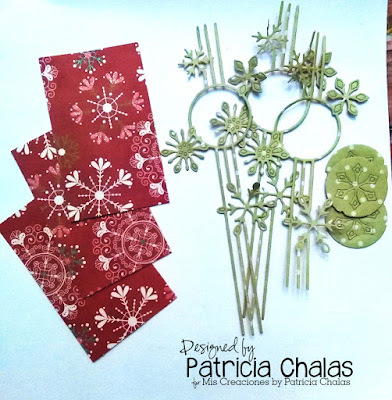 Hi everyone, Patricia here with another inspirational project for you! I have a Cute & Simple Christmas Tags for you today. First I die cut using Tuck Corner tags in Blue perlaized cardstock the rectangle for the tuck using DP and the Snowflake centerpiece all of them 3 times. then it was time to put all the layer together, first the blue base layer, then the rectangle DP and then using my fine tip glue pen I glue the Snowflake centerpice and accent all of it using a red rhinestones and satin red bow as the final touch. I love it, and the easy it is to make using this dies. I will repeat this in a few other color combination. Just an observation: when you die cut the Snowflake centerpiece.. keep the negative side of your cut out, you will see why on some future post from me. Such pretty tags! The snowflake die matches so well with your backing paper. I love how the tag dies have the corners cut in, ready for your paper. These tags are so pretty, Patricia! 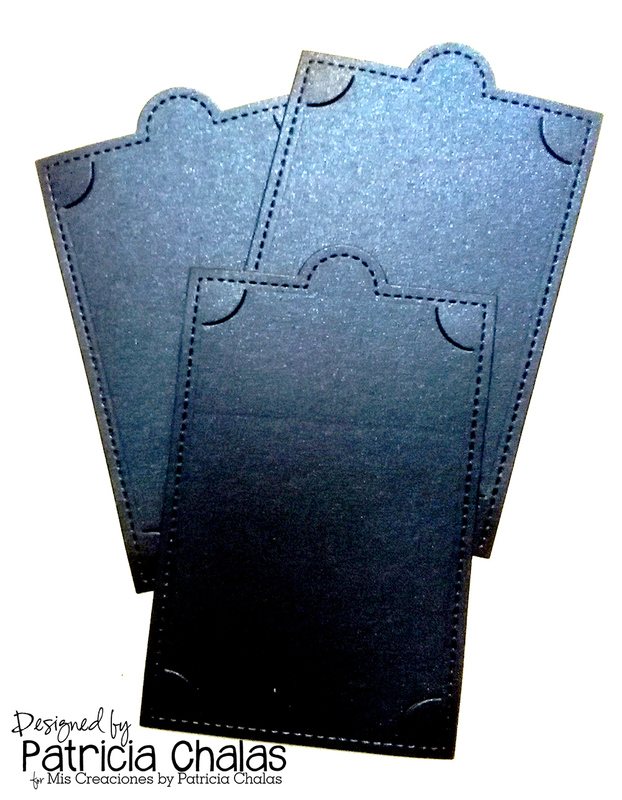 I hadn't seen that tag die cut before so now I've added it to my ever growing wish list. Thanks for the great inspiration!! Great it is so cute...mine wish list is neverending!!! Wonderful layering on these tags. I'm sure you will get lots of use out of them soon. Oh I just love Tags and I adore yours! So pretty, so sparkly, so festive! These are great! OMG these are awesome Patricia! Like the others, I hadn't seen this die before ... yep added to my wishlist! LOL Thanks for wonderful inspiration! Thanks Darlene!! This die will be very helpful. Sparkly cute, and so pretty! 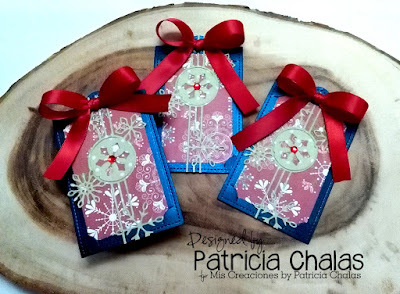 such a pretty use of the dies together, make such lovely winter tags! !